Its been fun catching up with Miss Patty and Dan since we last camped together in Quartzite/Yuma. After breakfast, it was time to get to work. The first order of the day was to wash the front of my RV so I could see out the windshield. Apologies to all the spiders that are now deprived of their homes, but Mi Casa is NOT su casa. After packing a few things in the freezer, we hit the store for dinner supplies. I love it when we get together, as Miss Patty becomes the resident Chef, cooking up lots of low-fat tasty goodies for dinner. The homemade chicken alfredo with veges was wonderful!! I seriously don't know how she does it. If "I" put that together, it would end up in the trash. Patty has a green thumb when it comes to cooking!! While eating, Dan's once reglued crown came out ... OH MY!!! ... so I quickly got on the phone to my dear friend Karen Spradley who works at my dentist's office. She made an appointment to have it fixed this morning at 10:00. Talk about service!!! It took me 20 years to find Dr. Creed Rowan's office and I have been a patient there for over 20 years. This is one of the reasons why. It's rare to find this kind of service nowadays. While at Walmart yesterday, Dan found his favorite Blueberry Cheesecake Ben & Jerrys ice cream. Don't tell him, but I discovered that flavor isn't so bad after all. One down, two to go!!! Oops, I mean ONE to go ... he remembered they were in my freezer. About 6:30 Patty came in with a new concoction ... 321 Cake. Now I've been around Patty for a long time, and we have tried lots of "creative" things in the way of food ... but this takes the cake (pun intended)!! Mix up one box of angel food cake mix with one box of "whatever-you-like" cake mix (she had chocolate). Measure 3 tablespoons into a cup. Add 2 tablespoons of water (and whatever goodies you want .. I added some mini chocolate chips), stirring to mix. Microwave for 1 minute. There you have it ... 3 2 1 cake!! Now really, this may be something you want to share with your grandchildren for fun. I'm not sure you want to serve this at your next ladies tea party. But it was fun fun fun to make, and the chocolate chips that stayed at the bottom of the cup, became frosting when turned upside down. We figured it's pretty much fat free and you end up with about 6 ounces of cake. Not bad for a quick sweet tooth fix!!! My new neighbors pulled in yesterday afternoon and I'm sooooo excited! This signals the start of my biggest RV adventure to date. After a few phone calls, we scheduled out the next four days before we head off to Grass Valley for the Golden Spike Rally. I'm all about old west gold mining towns, and it sounds like Dan and Betsy have set up an exciting outing. There will be lots of visiting, a little baking and more preparations on my part before we leave ... I'm counting down the hours!!! One of the irritating problems I have is finding DEF (Diesel Exhaust Fluid) for my RV. New EPA standards require recently built diesel engines to carry this fluid, which is sprayed into the exhaust to reduce oxides of nitrogen to water and harmless nitrogen. WHATEVER!!! All I know is that if I run out, the engine quits. With no access to the service station fluid (wrong side of the RV) I'm looking for alternatives. Thanks to Dan, we actually found some boxes at my local Walmart yesterday ... what RV'er goes anywhere without a stop at Walmart!!! $11.97 per gallon but they only had two. A stop at every Walmart between here and Canada should afford me enough to make it through Alaska!! The next few days will be busy ones so I know they will pass by fast ... which is good because I'm ready to hit the trail!!! Just When You Think It's All Taken Care Of !! It's NOT!! This being my first time away for an extended period of time, I'm not used to all the things that need to be taken care of. Pretty sure I've said that before!!! One of my sprinkler zones decided to take a break, so I called a sprinkler repair guy to fix it. He got it repaired, except when I got home at 10:30 that night from cashiering Bingo for the Elks, I quickly discovered I had no water. I called anyway and left a message. At 6:00 am he showed up and turned the pump circuit breaker back on. Apparently I have no shut-off valve for the sprinklers. Since that's something major, it will have to wait until I get back. Looks like a lovely mess to me!!! I thought I had it all under control until I got the mail yesterday. I received one of my most favorite letters ... from DMV. I'm sorry, but I hate these guys. They have never done anything for me but raid my wallet again and again. My diesel truck license went from $170 to $360, on top of which I now have to have a smog certificate. It will be due in another month ... I immediately called my local repair guy who said "bring it in ... I'll get it done". YAY!! While there, I asked him exactly what they check and if anyone's truck DIDN'T pass. You're going to love this ... they all pass!! They just check to see that you haven't modified anything. This must be part of the "share the wealth" plan, because it cost me $58.25 to have them tell DMV. I could have told them for free that there were no modifications!!!! Horse meds, horse grain, a second saddle rack, haircut, charging every battery I own, fueling vehicles, updating the will (you never know! ), inventing new ways to hold the bird cage in place, munchies and dessert for the Golden Spikes rally, baking bird biscuits (picky eater) ... it's never-ending!! I'm sure there are lots of things I haven't even thought of. Hopefully Patty and Dan will give me some tips when they arrive tomorrow. Six days ... counting down!!! Two of my least favorite things to do, along with second guessing myself about what to take and what to leave!! I'm heading out soon for the biggest RV adventure of my life .... ALASKA!!! Like the old west pioneers, I may be dropping significant stuff along the trailside in order to brave the elements and lighten the load. I've heard "pack for summer" and "pack for winter", so I'm taking both!!! Since my two dogs Jessie and Cooper are going, I've tried to somewhat measure out the dog food, fully aware that it's a total shot in the dark! The parrot Jonathan is a completely different story, as he has to have specially baked biscuits with lots of fruit and some hard boiled egg. Nothing worse than a picky bird!! As for the seed, I just bought all they had and stashed it in the belly of the beast. After the first disastrous trip with Jonathan, this one will make or break him!!! Today I'm taking all the canned food from the upper shelves and placing it closer to the floor. I just don't want to take a chance of something crashing to the floor or hurting the dogs. Next up, weed and bug spray ... oh, and cleaning the house. Ugh!! Upon our return, I'm planning a two week stay in Hawaii to rest up from the vacation adventure, followed by 10 days in the jungles of Costa Rica with the snakes and howler monkeys. Miss Patty chartered this one and I figured she needed a body guard!!! Not some beautiful elegant place like Greece or Paris .... but down and dirty Costa Rica!!! I can't wait!!!!! Back to my checklist .... I'm getting behind, so it's back to work!!! I'm so excited!! Yesterday I hauled my remaining horse to Taylor Veterinary Hospital to see Dr. Craig Brooks, an exceptionally nice guy ... like your next-door neighbor. Dillons Showboy ... better known as Showby, has Cushings disease ... a small tumor in his brain. Among other things, it causes his thick heavy winter coat to not shed off (making him very hot in the summer) and severe lameness until they have to be put down. Not that you care, but now you know!! At any rate, I've had him on some meds prescribed by another Vet in this office, since last October that have worked so well, Craig said he wouldn't have known if I hadn't told him. The good news is (and to make a long story short), if I continue with the meds, he will live several more years and Craig sees no reason why I can't take him to the mountains to ride, once I get him in shape. I'm so happy I can't stand myself!!!!! After my recent loss, I just didn't think I could take another. Here's my happy boy ... he'd be more happy if I gave him some grain, but that's not on his breakfast menu any more. Now I can get back to planning/packing for the trip of my life ... Alaska here we come!!!! No, not THAT kind .... the hot water laundry kind!! First off ... after the Escapees WARE Rally in Lodi, several RV friends came to Merced to spend a few days at the Elks RV Park. If you are an Elks member, definitely check out our new facility. I'm not sure exactly how many sites there are, but I think at least 20, all level gravel. Each site has a concrete slab with picnic table, 30 & 50 amp hookups along with water. The dump station also has water for cleanup. 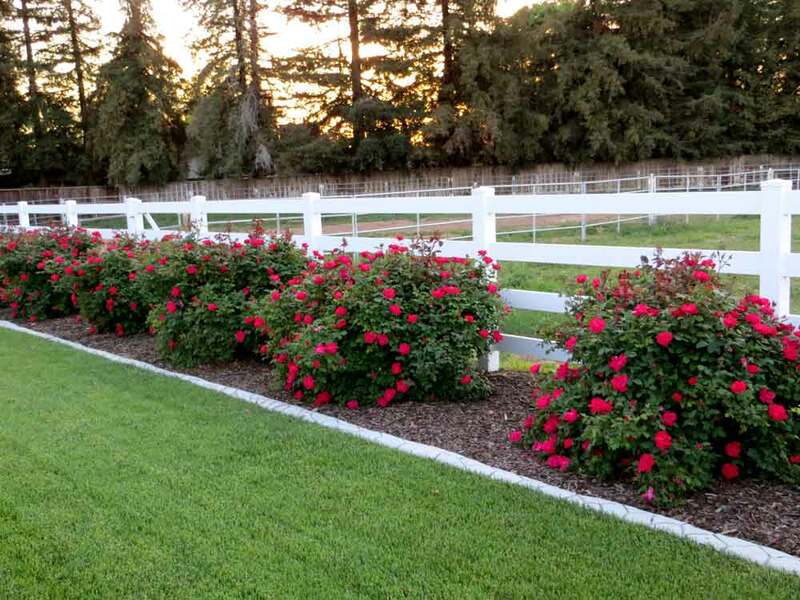 There's lots of grass for the puppies, a free laundry room with bathrooms and showers, as well as a large covered concrete patio area with matching gorgeous kitchen. About two miles out of town, it's nice and quiet. Check the schedule for their pancake breakfast often served here. I've been trying to keep busy since the loss of my best horse friend Remy and knitting/crocheting does that ... sort of. On a recent trip to The Urban Sheep in Modesto, I picked up a brochure on a class they were offering ... baby slippers. Cutest little things ever for those that have grandchildren. I gathered up Cyndae Marachino from the RV park and we headed to the class. Crochet this time ... four of us carefully followed the pattern and ended up with this not-so-cute version, full of mistakes!! Unfortunately, the variegated yarn they had me choose from didn't work so well for matching purposes. No fear she said ... they will come out just fine in the wash!! Now for the shrinkage!!! These are about 5 inches long ... and after washing in hot water for 25 minutes (called felting), they turn into this!!! These are now about 3 inches long. Pretty darn cute if I say so myself!!! Stuffed with paper towels and placed on a cookie rack to dry, they should be wearable soon!! Being a runner, I was outraged at the events that took place at the Boston Marathon. My heartfelt condolences to the families who have been affected by these people. We allow them to come to our country for the freedom, education and better living conditions, and in return they devastate American families. I'm glad to see that Boston immediately took the necessary steps to bring them to justice. So far they have received exactly what they deserve. I hope they were scared and panicked while being sought ... and I hope the remaining person is feeling total desperation as he contemplates the end of his life!!! 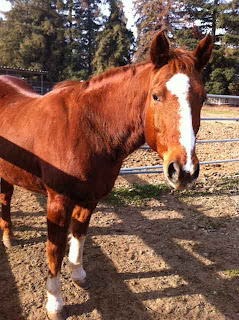 On another note ... thank you for your thoughts regarding the loss of my horse Remy. Horses are funny creatures ... they live 20-30 years, and through their trust of you, totally get into your heart. This lovable guy always wanted to be in my back pocket. He was the most affectionate horse I've ever had, which is why I feel his loss to such an extent. He will always be with me!! Sad news .... my baby horse Remy had to be put down today. I bought him when he was two years old as a Reined Cow Horse Futurity prospect. He could spin on a dime so fast he made me dizzy. He turned 22 years old this month. The Vet said we can't determine how, but at some point he got a bone infection in his left hind leg sesamoid bone. Last July/August we went through 30 antibiotic pills a day for 60 days, as well as pain meds. In September/October, we did it again because the x-rays appeared to show the infection was improving. Last week, he began limping badly again. After more x-rays and more meds, I took him in today for additional tests. It was bad news ... the infection was much much worse than we imagined ... even surgery was not an option. He cannot even walk without pain, and when we trotted him around, he wouldn't put his hoof down. The prognosis, from excellent to good to bad, wasn't even on the chart and there is no alternative. I'll miss him tremendously .... he was my baby!!! Spring Hits My Back Yard!! It's been rather stressful around my household for the last couple of weeks, so I haven't been blogging. Trying to get things organized for a lengthy trip is more than I bargained for. I don't know about you, but not knowing what's going to happen with my animals until the last minute, doesn't help my stress level!! Remy has his bone infection back and the meds are like gold ... not sure the boarding facility will be willing to give him his medication daily. What keeps me smiling is this little guy, who is either playing with his ball or sleeping. I caught him playing catch here. I've never seen a dog use it's front feet like Cooper does!! Spring is here in all its glory ... meaning weed pulling, spraying, mulching, trimming ... in other words, WORK!!! 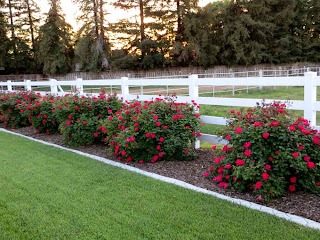 Thanks to Patty Chance's magic clippers, my roses are in great shape and blooming like crazy. Also back are the hawks that make the tall trees home after the buzzards leave. 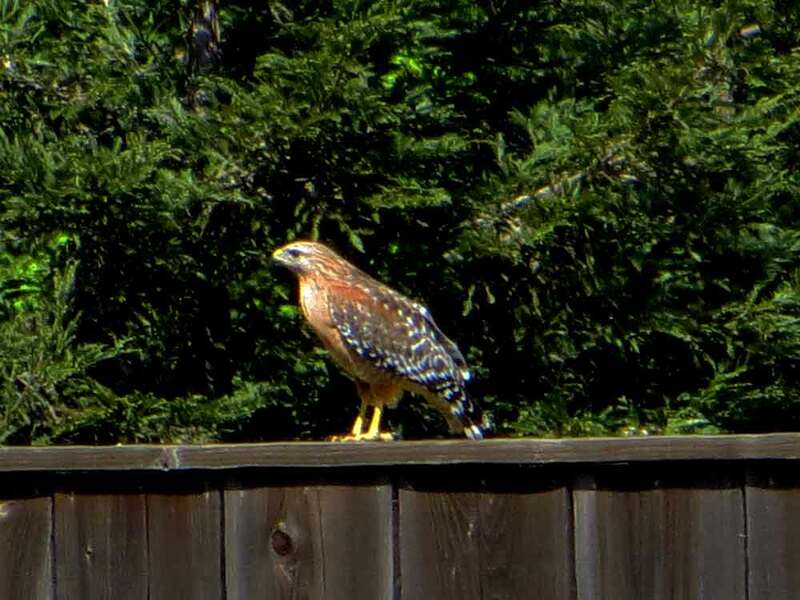 This guy landed on the farthest fence ... I tried to sneak up for a better picture, but he was pretty camera shy!! He and his mate squawk loudly every morning while looking for breakfast!! Heading off to the feed store to find some tasty morsels irresistible to horses, so I can mask the bad flavor of Remys meds. Wish me luck!!! A Note From Bob Tiffin!! I think I've written in the past about my experience with Tiffin regarding my Phaeton motorhome. I've received excellent service at every turn from them, even so far as sending a rep to my door where he spent the day helping me get the California DMV smog approval. Another problem I have recently encountered is the DEF tank location. I went back to the T&A travel center to check out the DEF pump and see how I might be able to fill my motorhome tank. With a little wrangling I might be able to pull into the second bay and pull the hose around. The problem with that becomes the fact that I am then taking up TWO lanes (the DEF pump uses the same pump as lane #1) endearing me even MORE to the truckers who can't get fuel. To make it even worse, T&A says I have to have a FUEL card ... debit and credit cards do not work for them. The answer to my question of how I get one was ... "I don't know". Okay then ...... guess T&A won't be getting any business from me. A surprise came in the mail to distract me from DEF ... an early birthday present!! Miss Patty and her hubby Dan work the Tucson Rodeo every year, and while there met up with a local artist who makes beaded hatbands ... the perfect accessory for my old time Beaver cowboy hat. More things to take care of before the big trip ... much as I LOVE my motorcycle, I haven't had time to ride, nor have I been able to find a riding partner. The girl I purchased it from has been bugging me for the last year, to PLEASE sell it back to her and she has finally come up with the money. Knowing it needed air in the tires, fuel in the tank and a battery charge, I set out to get it in shape. Tires .. check! Fuel .. check! Battery ... NOT! Today I'm off to the bike shop for a new one, which her husband will install for the ride to the bank tomorrow. They want pictures and the pink slip ... I want a big check. That's one more thing scratched off my pre-trip list!! I'm sad about selling it ... it has always been one of the things I wanted to do, but this bike felt like it was someone elses ... I was afraid I might damage it in some way. At any rate, I'm sad to see it go. Yup ... I'm still knitting and crocheting. I'm going to have enough blankets to keep EVERYONE warm on this trip. Here's my very first knitting project!! Don't look too close or you will see all the mistakes. I ripped it out four times, hoping that starting over would make it error free, but no such luck. It was a learning experience and a great daily lesson in memory and working the old gray matter. Who would have thought THAT!! This 8 hour project took me 48 ... but no matter, I learned enough to be off and running!! Lots more to do and only four weeks to go ..... counting down!!! Happy Trails ... don't let that muley run you wild! !